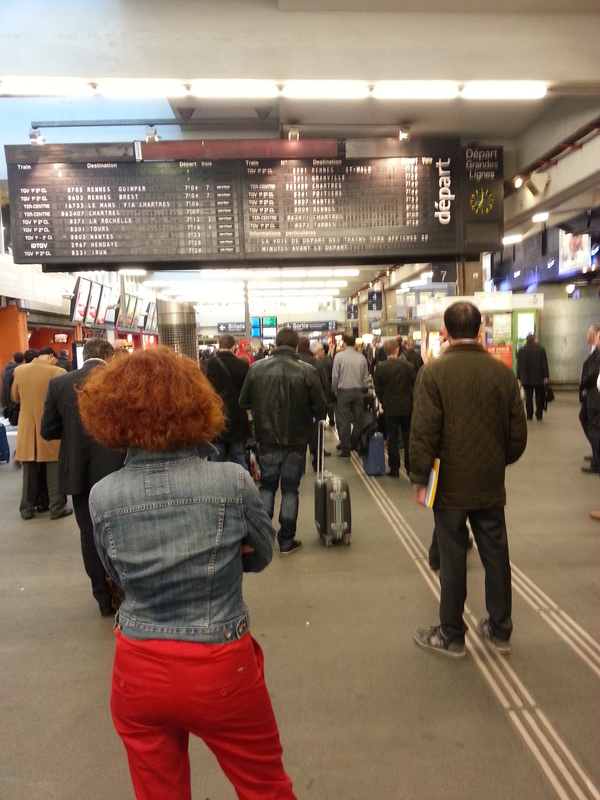 The SCNF train to Bayonne was scheduled to leave Montparnasse Station at 7:28 am, so we were up early and walked the three blocks to the station to arrive an hour ahead of time. There was a large board that hung in the center of the station indicating the destinations and gates, but we could see no Bayonne train as yet. I found the information booth and asked there about our train, and was told that it was still too early for it to be posted. We were just to wait and eventually it would come up showing the proper gate. At 7:20, the menu finally clicked over to show the Bayonne train at Gate 6 and suddenly there was a mad rush from the main concourse. We followed the cattle call and found that we were near the back of the pack by this point. Now we couldn’t figure what coach to get on. There was a gentleman nearby who noticed our confusion and offered to help get us on the right car. Eventually we got to the correct car and found our seats after stowing our bags away on top. 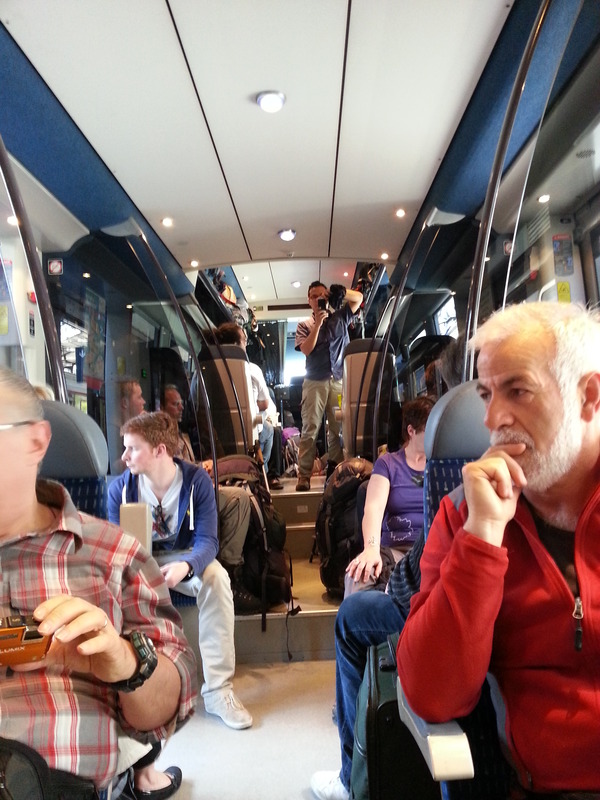 It was a very comfortable and spacious coach with adjustable seats and soon we were settled in for the 5-hour trip. 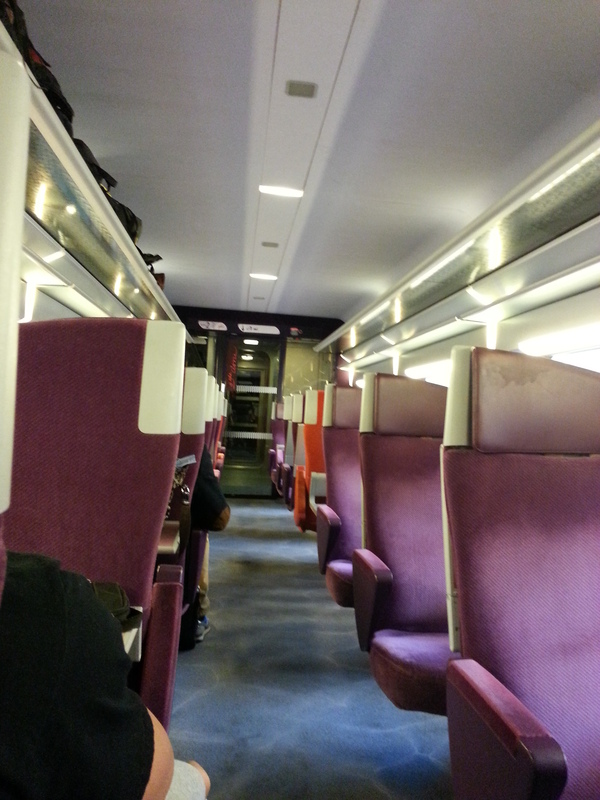 We pulled out of Montparnasse on time and were outside the city in less than half an hour. After a while, we found that we were getting hungry and took turns going to the dining car to get some food. Greg went first and came back with water and some fruit. I made my trip and found some fresh-brewed coffee and pastries which I brought back to the seat. This was turning out to be a delightful trip so far until we discovered that we had a problem adult child directly in front of us. As the sun began to come in our shared window, he closed the blinds, apparently because his laptop screen was hard to see. This meant that we could not see out to view the countryside. Greg pulled the shade open and the guy abruptly closed it again. This was getting annoying, and Greg smiled at me and re-opened the blinds. Now the guy was getting ticked off and stood up and muttered some cuss words in French at us while violently closing the blinds. He was a young 30-something who was dressed in warm ups and looked as if he had spent many hours in the gym. 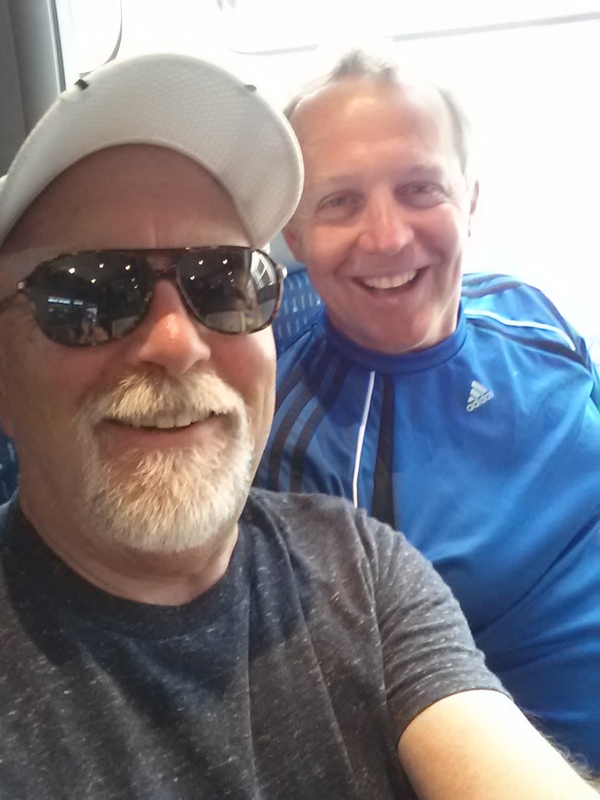 There was no conductor in sight to arbitrate this matter, and since neither Greg nor I were going to challenge him to a fight, we thought it best to try and change our seats. Fortunately, there were two seats in the same car down a few rows and we got up and moved. Now we had a window all our own, and hopefully no one would get on at a subsequent stop to claim them. We kept the seats the rest of the way and made it to Bayonne on time. When we got off the train, we found that we had approximately two hours to wait to make the connection to St Jean, so we got our luggage and trudged through the small, quaint station to the outside area where we found a table outside a cafe. A waitress soon arrived and we ordered some food. Greg ordered a grilled sandwich and fries and I got a tuna sandwich and a beer. She brought a full array of condiments, including mustard. This would be the last time we would see a container of mustard for nearly 40 days! Just behind Greg, I could see our bully from the train leaving the station and moving out into the town proper. I think we were both somewhat relieved that he would not be going on any further. When the time arrived, we got our gear together and headed upstairs on the other side of the station to the platform from where our connecting train was leaving. Soon there was a rush of many pilgrims attempting to do the same thing with fingers being pointed in many directions. We boarded what appeared to be the right train and found that there were about fifty others that shared that opinion. Stowing our bags in the compartments above, we found a seat. The car was packed with pilgrims, many standing with just a backpack and walking sticks. The ride to St Jean lasted about 1 1/2 hours and was relatively uneventful. The passengers were generally quite gregarious and talkative, and we began to feel the comraderie that we would experience again and again on our adventure. Although I could not tell for sure, it appeared that we were the only Americans on that train except for one woman, whom we would later encounter on a few occasions. It was interesting sitting there and listening to the various conversations around me, trying to figure out what they were saying. We were both in a great mood and feeling quite rested at this point. 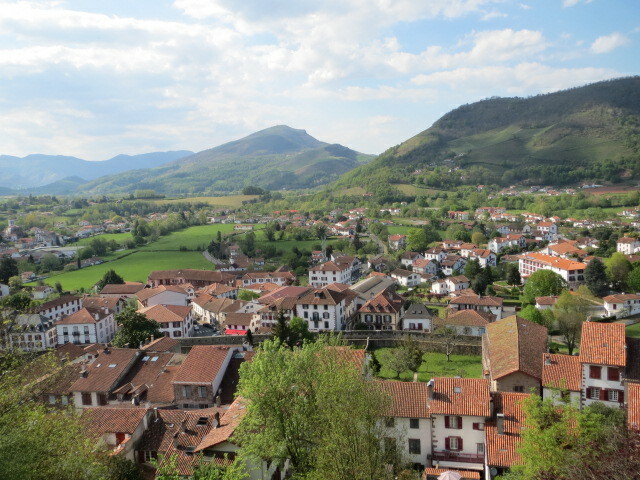 Our small train made several stops along the way at tiny, quaint towns in the Basque provinces on the eastern slopes of the Pyrenees. Along the way, the topography seemed almost jungle-like with very dense vines and thick forests, then cleared out when we got to a stop. 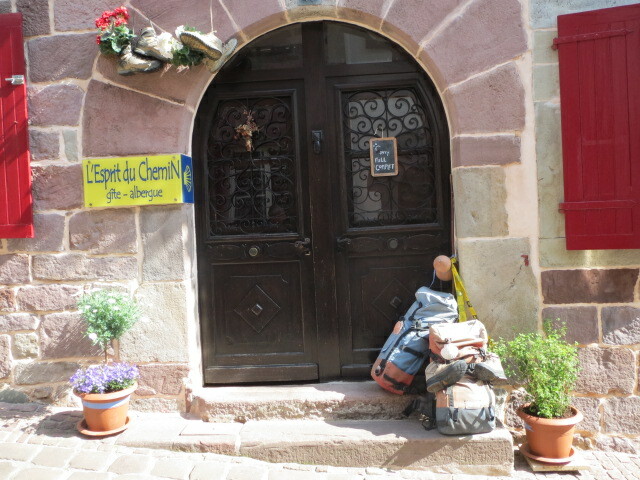 We arrived on time in St Jean at about 4 pm, got our bags down and began the walk from the station to the Hotel Central. The afternoon sun was beginning to settle over the mountains in the distance, but the town was still bathed in beautiful shadows. This is really picturesque village, with so much to see. It really deserves a longer stay if one has the opportunity. After a short walk from the train station, we arrived at the Hotel Central right in the middle of town and checked in. Madame Chiqui greeted us warmly at the front desk and our bags were carried upstairs to the room by a friendly fellow who thought we were Irish because of my hat (from the Shamrock Half Marathon in Sacramento). Greg remarked at the man’s strength carrying both bags, and he proudly displayed his arm muscles, indicating that it was “Basque strength”! The room was huge compared to our room in Paris. There were windows overlooking the river in the bedroom area as well as the bathroom. While Greg got in the bath for clean up first, I went downstairs and got the WiFi connection straightened out with a special code. Somewhat complicated, but nothing like the code for the Paris Hotel. Madame Chiqui said that dinner would be served at 7:30 in the dining room and that breakfast would be at 8am the next morning. She showed me where to leave the bags in the morning so they could be picked up by the bag service. I returned to the room to find that Greg had finished in the bath and I instructed him on the WiFi, which did not seem to work for his iPhone. This was the first of many instances where one code was necessary for each phone. I got my bath and took some video of the river below us. Greg and I then set out to walk around the town. 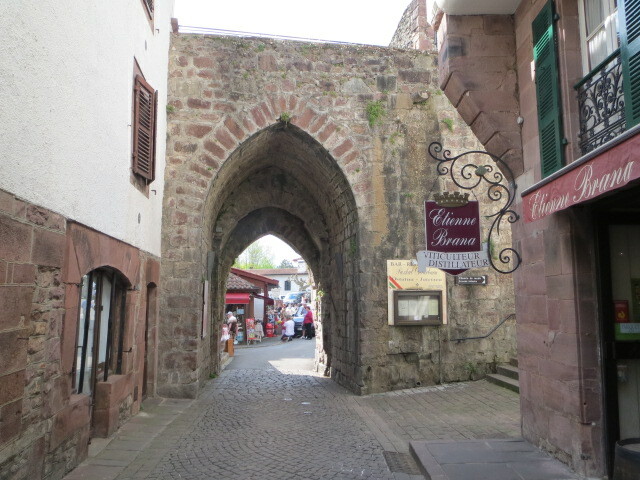 We walked through the arch along Rue L’Eglise and turned left on Rue d’Espagne which turned into Rue de Citadelle. 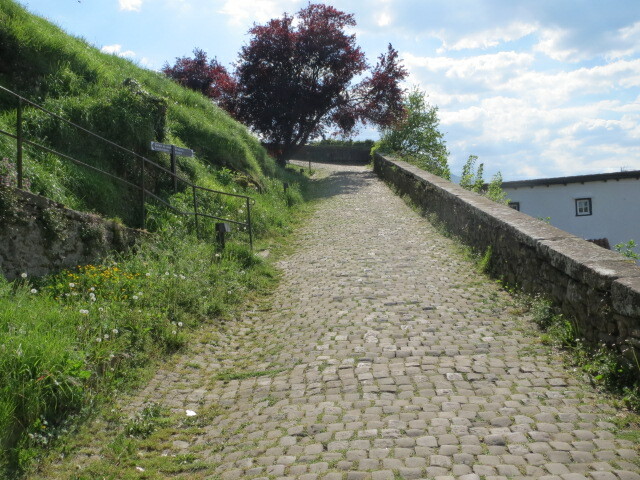 At the top of the street we could see the steep path heading upwards toward the Citadelle and decided to check it out. There were phenomenal views from this high perch above the town, and we gazed across the city towards the mountains which we were about to scale tomorrow. 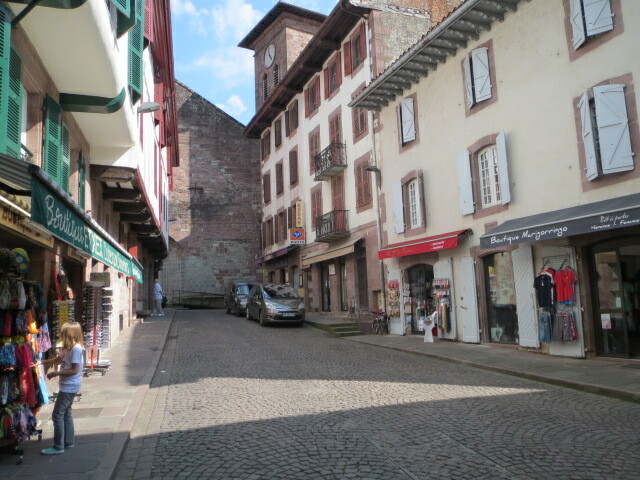 As we headed back down Rue de Citadelle, we noticed many pilgrims lining up outside some of the Albergues, trying to get a bed for the night. 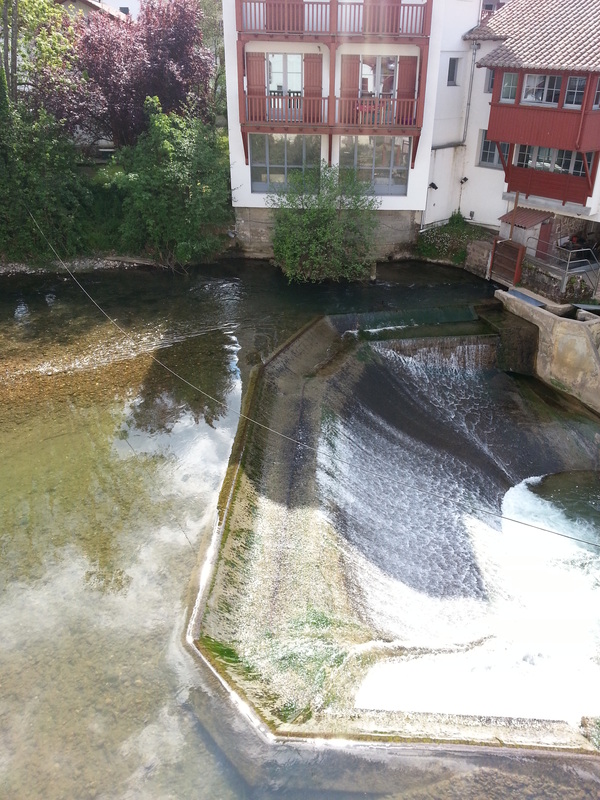 Although I had known this before the trip started, I was now beginning to see first-hand the issues of life in the albergues. Most of us had arrived on the same train from Paris, but many had not yet found a place to stay – and here we were having already checked in and cleaned up for the evening. This was a scene that would repeat itself over and over again in the six weeks to come. There is an adventurous, spontaneous piece that is missing when one stays in a reserved hotel room, and certainly a dramatic difference in cost, but there is also that comfort in knowing that there is a room and a private hot shower or bath waiting, no matter what time you get in. Neither Greg nor I were ever sorry we had made the choice to book our hotels ahead of time. We were able to sleep soundly, and we were always well-rested for the next day. 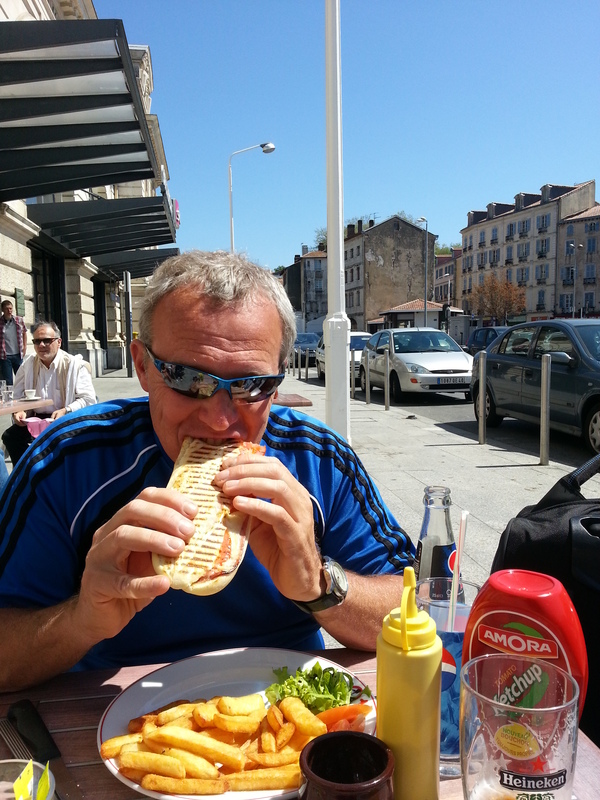 Back down in the town, we decided to find some food for our trip the next day. There was a small market that had fruit and cheese and bread, but it was already closed for the day. We felt that we could supplement whatever we needed from the breakfast in the morning. We also found an outfitting store that sold trekking gear and Camino paraphernalia. I considered buying one of the hats, but decided to save the money for something I really wanted or needed later on. We looked at several of the restaurants that were surrounding the main downtown area, and discovered that they were not yet serving dinner, but just snacks and drinks. Some very nice outdoor cafes in this area. We decided to go back to the hotel and eat in the restaurant there. After heading back to the room, we were able to get Greg hooked up on WiFi, and he contacted Marianne, his wife, on Facebook. 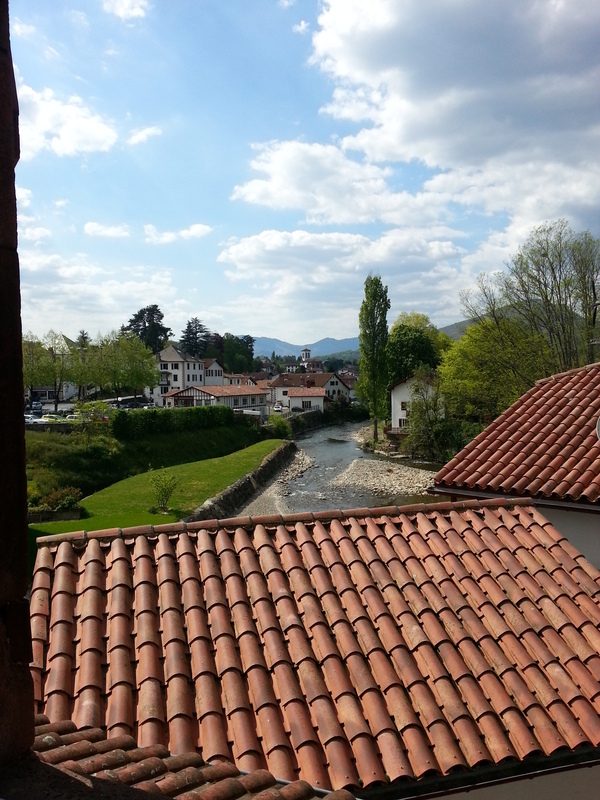 I did the same and posted some pictures of the view from our room as well as a really bucolic photo of the River Nive. Dinner was elegant, and one of the nicest we were to have on the entire trip. We had the local red wine that was bottled in town. I had a cheese omelette and Greg had a serving of salmon. Delicious. Soon after dinner we headed back to the room and hit the sack.